With Friends Like These (Formally known as The Incredible Journey of You and I) is a game that lovingly forces co-operation. Everyone on your home planet is super bored and over worked! So You and your bestie have decided to take everyone on a trip to Fun Time Planet where everyone can let off some steam. Unfortunately, things go wrong and you crash into Super Chill world, your friends don't realise they're on the wrong planet and start to cause chaos. It's up to you and your pal to collect up all your friends before they completely trash the place! Super Chill planet is made up of water and air floating around everywhere. Players have to work together to navigate their way around and find their fun loving party friends. While the blue player flies the ship in water, the pink player will zap pink 'bullets' that teleport your friends back to the bus. 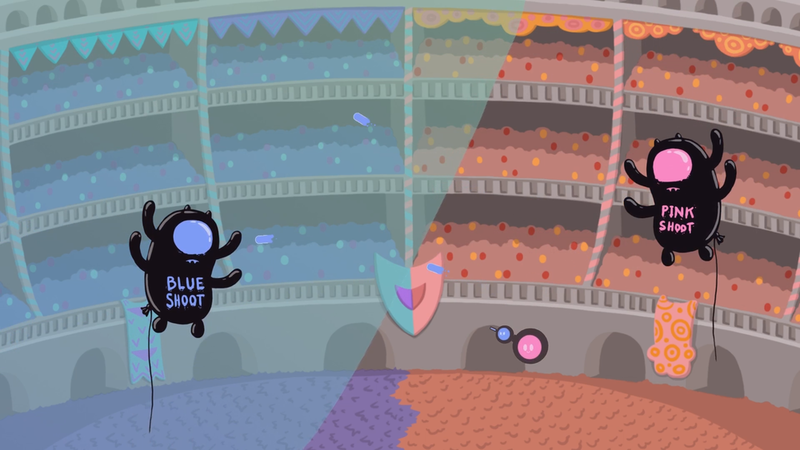 When the ship flies into air, the roles will swap, the pink player will then fly and the blue player will zap blue bullets. You also have to match the colour bullets to the colour of your friends eyes. Each area has been hand crafted to make the players work together in new and interesting ways. CO-OP SWAP: a unique mechanic of swapping controls between two players. One second you will be flying the ship, the next you will be shooting bullets. BULLET COLOUR MATTERS: Each player has different coloured bullets. One player has pink, the other has blue. This will affect how you are able to teleport your friends. ART STYLE: A fun, cute and colourful cartoony environment that is appealing and inviting. BUSY FRIENDS MODE: unable to get your friends around to play? We've got you covered with two single player options. One is a challenging brainteaser where the controller is split into two, one half controls pink, the other controls blue. The other option is easier where the controls dont swap at all, the thumbstick will always fly the ship and the trigger will always shoot. That way you can just enjoy the ride! Shy Kids Club was founded in 2015 by a husband and wife team who have a love for co-op games. They are currently living in Canberra, Australia, working on their first game.